At 331 feet tall and made of white marble and concrete, George Washington Masonic National Memorial in Alexandria, Va. offers some of the best views of the city. Graduation is the time to take advantage of the family car. With relatives driving in or renting a car, exploring outside of D.C. has never been easier. Maryland and Virginia both have unique tourist spots that are tricky to get to without a car, but these spots are also more likely to offer a brand new experience for you and your family. 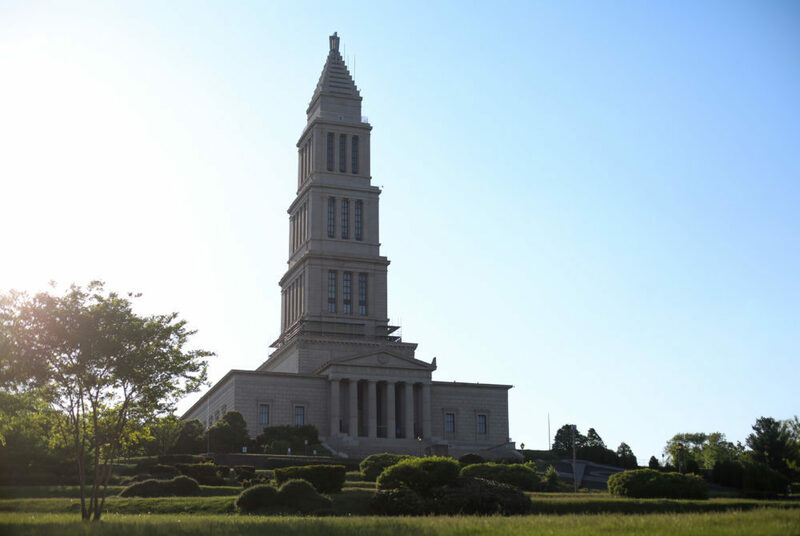 If you’re going to have major George withdrawals after graduation, get your fill at George Washington Masonic National Memorial in Alexandria, Va.
At 331 feet tall and made of white marble and concrete, the nine-story masonic temple offers some of the best views of the city. At the top of the building’s obelisk, an observation deck presents a panoramic view of the Potomac River, D.C. and a section of Virginia. With photogenic sights and structures, it’s no surprise that scenes from “National Treasure” were filmed on location. White Pantheon-inspired columns greet you as you enter, followed by portraits and bronze busts of the former president. The memorial serves as a museum to Washington’s history and his ties to Freemasonry, with artifacts on display like the clock used to pronounce his death. After you pay homage to the founding father, you can spend the rest of the day exploring by visiting nearby Old Town Alexandria’s historic taverns and museums. 101 Callahan Drive, Alexandria, Va. 9 a.m. to 5 p.m. 20-minute drive. $15. It’s easy to get caught up in the hustle of D.C., so swap the concrete jungle for a nature hike in the woods when you have visitors in town. Thirty minutes away from campus, an 800-acre nature mecca can be found at Great Falls Park. This national park spotlights the power of the Potomac River through waterfalls and breathtaking views of the water. The views are jaw-dropping, and jutting rocks offer perfect spots to pose for a family portrait. Picnic tables, parking lots and grills are available, and a snack bar sells french fries, pizza and other light snacks for the family to refuel. Climb along dramatic cliff tops and more than 15 miles of hiking trails, but don’t jump in the river – swimming is prohibited because of jagged and rough waters. 9200 Old Dominion Drive, McLean, Va. 7 a.m. to dark. 30-minute drive. $10 parking. The Smithsonian National Air and Space Museum on the National Mall has a twin location in Chantilly, Va., about 35 minutes away by car. The Steven F. Udvar-Hazy Center boasts two huge hangars full of spacecrafts and aircrafts. Younger siblings who dream of flying and exploring space can let loose in this complex. Thousands of artifacts are displayed on the hangar floor and in suspension, like the Lockheed Blackbird stealth aircraft, or the space shuttle “Discovery,” which spent a year in space and traveled 150 million miles, the furthest any shuttle has gone. If you want to test the cockpit, they offer flight simulations in select vehicles. The IMAX theater will show seven movies one to three times daily, which range from topics about planet Earth to D-Day – and even the newly released “Avengers: Infinity War.” In the same building, an elevator takes you up the Donald D. Engen Observation Tower. At the top of the tower, 165 feet high in the air, you get a bird’s-eye view of Dulles International Airport, and perhaps your alma mater in the distance. 14390 Air and Space Museum Parkway, Chantilly, Va., 10 a.m. to 5:30 p.m. 35-minute drive. Free. It can be hard to please everyone, but the National Harbor houses a plethora of activities all in one place for the family that can’t all agree. More than 160 stores, from Build-A-Bear to outlets like Michael Kors and Nike, have something for everyone in the family. Explore the several outdoor art installations around each corner, like “The Awakening,” an installation of a bronze giant emerging from the sand, with giant arms for kids to climb. The Capital Wheel, the largest attraction, allows you to rise 180 feet in the air and point out sights from all over the DMV. MGM National Harbor also has a casino with blackjack, roulette and slots for lucky parents and graduates who want to toss their congratulatory cash. On the harbor, the family can enjoy the sunset from a boat cruise or venture off alone with kayaks and paddle board rentals. The eventful outing will provide much-needed separation before another day of family quality time. 101 MGM National Ave., Oxon Hill, Md. 20-minute drive.